It's a great measure of fitness that also allows for a comparison between athletes, but lets take a closer look. While meeting with data scientists at multiple pro teams, USA Cycling, and some of the best coaches in the business, we were often asked about road racing strategy and what factors matter most during specific sections of a race. In these discussions and throughout road racing in general, the term watts/kg is often brought up, analyzed (even scrutinized) and for many it's the golden metric. We do not disagree that watts/kg is a golden metric, but using Best Bike Split, we can show that for modeling tactics and strategy, it's just one of several metrics that impact the race. In this article we will discuss different aspects of a race and what factors play the most significant roles in each scenario. Before anyone accuses us of diminishing watts/kg, I want to point out that it is of course a very significant and meaningful metric to track and analyze. For one, it's beautifully simplistic and easy to measure and understand. As an athlete raises their watts/kg (through training and sustainable weight loss) they are inevitably gaining fitness. In that aspect it is a great measure of fitness that also allows for a comparison between athletes. For anyone who has used WKO4 software, you will see on the power duration chart how you or your athletes stack up to general classifications over various durations and there are definitely some minimum thresholds that an athlete must be able to hold to be successful at different racing categories. So while we completely agree that watts/kg is important,in an actual race where athletes are all within a certain range how much does it matter? It's actually a bit of a trick question because it is very race and condition dependent. To start we will take a look at what the peloton experiences over the course of a typical race in this case Stage 3 of the 2016 Tour Down Under. Using Best Bike Split and the Time Analysis (TA) tool we can start to see over the course of the race how and where these different factors start to have significant impact. It is cited that sitting in the peloton can save a rider anywhere from 30 to 50 percent in terms of drag depending on the conditions and position in the group. So what would a 50 percent drag savings mean for the riders sitting in at Stage 3? Using the time analysis tool we can decrease drag by 50 percent and start to decrease power until the time difference is close to 0. This will show an approximate average power for riders sitting in the peloton for the same ride. By doing this, you can see that at 50 percent less drag a rider can produce 30 percent fewer watts while maintaining the same speed. The actual average power experienced will tend to be a bit different due to drag benefit being less going up hills and more yo-yoing than steady state riding, but the tool gives athletes a good approximate. If we adjust weight up and down (and power to compensate) we can see that for the same general time, power to weight would range from 3.3 to 3.7 watts/kg. While this is interesting it doesn't really show what factors matter the most for the course. To do that we need to break the race down into key sections of importance. Using the TA tool we can also start to analyze if there is anywhere on the course that it would make sense to try to launch a breakaway. With a bit of examination, it's possible to see what factors influence the strategy the most. Again, looking at TDU Stage 3, let's increase power 20 percent and find the areas of the course that have the largest time gains for a sustained harder effort. For this type of analysis we can ignore the total gain/loss and the adjusted time as we are specifically focusing on potential individual segments. There are several candidates that look like good potential points depending on the goal of the break. An early break may be more about TV sponsor time where as a break on a hill may be to try to stay away. We will get into hills in a bit, but for now let's focus on a break that is more like a time trial. In that case we can reduce drag a bit (getting into a bit more aero position) and see which potential break points would gain more time. To really illustrate areas that are predominantly affected by drag we can also add a significant weight increase in conjunction with the drag reduction and see the sections that remain positive and have little movement from the adjustment. We are all familiar with the great sprint finishes at the Tour de France. The pure sprint finishes are typically longer flat run ins that in recent years have been dominated by names like Mark Cavendish, Andre Greipel and Marcel Kittel. So does watts/kg matter in the sprint? Well the answer again is that there is a range of watts/kg that show you could be a good sprinter, but what matters more is Max Power, Sustained 10 to 30 second power and Drag (CdA). Throughout the acceleration and sustained velocity phase, the balance of sustained high power and lowered drag can make the split second difference on the line. Caleb Ewan's unique (and obviously very practiced) sprint style demonstrates this perfectly and helped him win two stages at the 2016 Tour Down Under. For some quick analysis, we will ignore the acceleration phase and look purely at the sustained power and velocity for the sprint into the finish on a flat road and contrast a rider like Greipel with that of Ewan. In 2014, Greipel won Stage 6 of the Tour Down Under in Adelaide in a sprint finish. 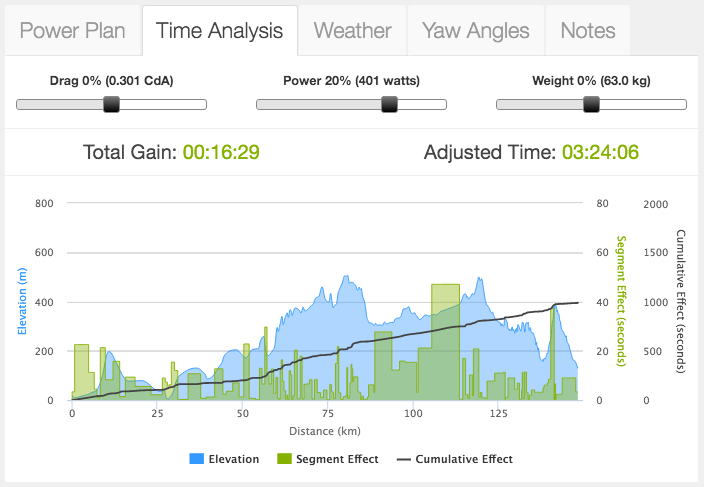 To win, he averaged 945 watts for 23 seconds, hit a peak of 1,916 watts, averaged in excess of 60 kph, which equates to about 12 watts/kg. If we just look at the rider weight difference effect on power but assume the same aerodynamic drag for this sprint you can see that based on Ewan's weight he would need to push 932.5 watts or 15.5 watts/kg to maintain the same speed! 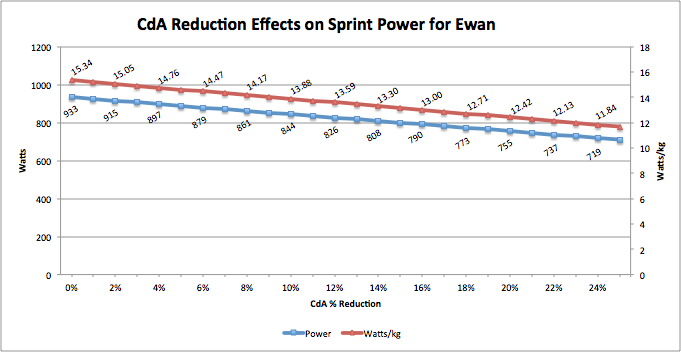 The chart above shows the watt and watts/kg savings by percent of drag reduction from the initial overinflated CdA number for Ewan in Table 1. While we don't have Ewan's data for the Tour Down Under, you can quickly see how important these drag savings can become in the sprint to the line. To put it in perspective, at these speeds, a 2 percent drop in drag gives the same benefit power wise as a 20 kg weight reduction once up to speed (assuming a flat road for the sprint). The chart also indicates that Greipel could still possibly get the better of Ewan on any given day despite a lower watts/kg as Ewan's drag numbers would need to be more than 20 percent lower to put him in the same watts/kg range for the same speed. Due to Greipel's 10 to 30 second mean-max raw power being so high, Ewan would most likely need a combination of a higher watts/kg along with superior drag to take the sprint. So now that we covered where watts/kg may not have as significant an impact, let's focus on the area where it does have an advantage and for grand tours it's these areas that make or break the GC. For a comparison, we can jump back to Stage 3 of the Tour Down Under. The last 10 km of the course consisted of a steep climb up the Corkscrew and a long very fast descent into the finish. For this analysis we will focus on the Corkscrew climb. Like the sprint analysis let's focus on two different sized riders. For this example, we looked at a smaller rider, around 63 kg, and a larger rider of 72.5 kg. With some assumptions about drag we can estimate that throughout the climb the smaller rider might put out around an average of 405 watts, or 6.43 watts/kg. That number would bump up closer to 6.8 for the steeper sections. Again, using at the TA tool we can see that for a larger rider of 72.5kg, to achieve a similar time in the steeper section of the climb their power would need to increase 11 to 12 percent. View a Model of the Corkscrew Climb. For sprinters, focusing on body position and sustained 10 to 30 second raw power and being OK with a bit more weight could get you those crucial hundredths of a second. Chris Yu, Head of Aero R&D at Specialized, has done similar research showing this. “The CdA change from a drops position to a slightly more optimized one is very individual, so it's near impossible to pin a number to it, especially since fit, not just pure aerodynamics plays a huge part. But in our experience working with athletes, we've seen small adjustments result in gains of over 2 meters in a standard 200m sprint.” That's a full bike length advantage in just 15 to 20 seconds. Even for climbs, finding the right mix of power to weight where climbs are still maintainable in terms of IF and FTP is crucial. 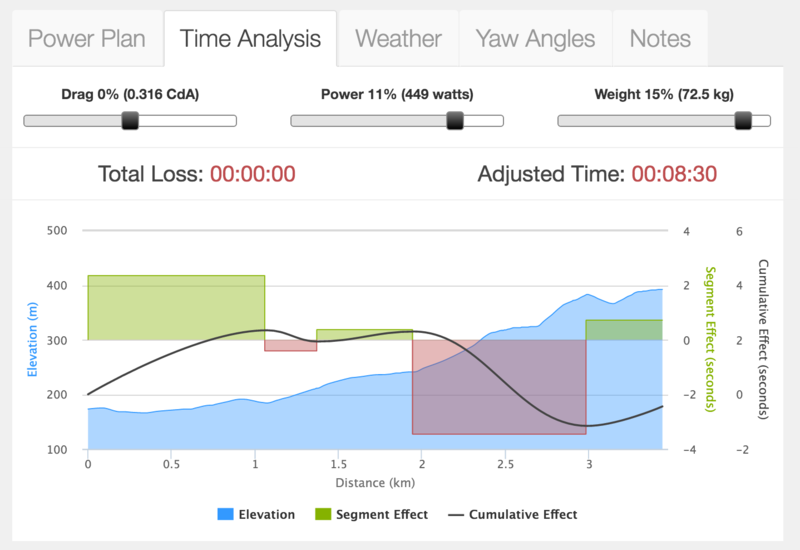 At Best Bike Split we are just beginning to explore how we can use our models and the Time Analysis tool to breakdown races and formulate tactics for both race strategy and course specific training. Analysis does require assumptions and unlike triathlon and time trials, there is not currently an automated process to optimize a strategy. In any given race things change extremely quickly, but knowing some general numbers and areas on the course to be aware of can help mitigate surprises and help inform potential decisions. We encourage you to check out the links in the article and play with the Power, Drag, Weight and/or Rolling Resistance settings to get an idea of how these factors work in conjunction for different scenarios. *All data used was previously made public or derived from a race.